Quickspin’s Gold Lab pokies game is mad scientist meets retro cartoon, using bright colours and lively animation to create an engaging player experience. For the science lovers, alchemists and crazy professors within us all, give Gold Lab a go to conjure up some magic elixirs which just might turn into golden wins of your own. Quickspin games are becoming increasingly popular and as such you’ll find Gold Lab and other hot Quickspin titles like Big Bad Wolf, Spinions Beach Party and The Wild Chase available at several of the best multi-provider casinos on the Web. Gold Lab is available for free and real money bets at all of the casinos recommended in the table above, with exclusive sign up bonuses available for our readers who register using our links. 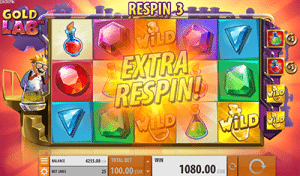 Gold Lab is a five-reel, three row video pokies game with 25 fixed paylines. It comes with wild symbols, a unique Golden Bonus feature, and a potential jackpot of up to 200X your active bet. With a theoretical RTP of 96.06%, there is some good winning potential within this game. To play for real money, sign up for an account at one of the trusted AUD casinos recommended above. Gold Lab is an instant-play game, which means you can play it directly over your Web browser with no download required, including for mobile play on both smartphone and tablet. The instant-play nature makes it accessible with all desktop and mobile makes and models, including PC, Mac, iOS, Android and Windows Phone. You can try it for free in practice mode first, then make a cash deposit to start playing for real money. All paylines in Gold Lab are fixed, so you just need to select the size of your wager. Minimum bets start from just $0.10 per spin, with a maximum wager available of $100, making this game suitable for recreational players and high rollers. 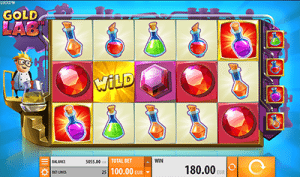 Wild symbol – the golden wild symbol substitutes for all other symbols to form a winning combination, except for the Golden Bonus scatter symbols. Golden Bonus – each of the four low-paying beaker symbols comes with its own corresponding scatter symbol, and when three of these scatters appear across reels one, three and five, the Golden Bonus is triggered, awarding four free spins. During the Golden Bonus spins, all corresponding beaker symbols on the reels transform into golden wild symbols for the entire duration of the bonus round. If you land another matching beaker scatter, you’ll receive an additional respin where all corresponding beaker symbols turn wild. Quickspin has been moving up the ranks of our favourite software developers, with Gold Lab providing a solid addition to its impressive portfolio of vibrant pokies. It’s not that this game is particularly innovative, it’s just executed with such high quality that it’s impossible not to love. The graphics are pristine, the sound effects subtle and unobtrusive, and we love the small touches like the scientist jumping for joy during every win. During our testing, we were able to trigger the Golden Bonus feature pretty easily when a high active bet was in place, and there’s some huge winning potential there.